Bradley Roberts puts tommy in school. Madame speaker, I rise on behalf of the dedicated and righteous Constituents of Grants Town, to contribute to the debate on Constitutional Amendments establishing many things including the Office of Public Prosecutions. Madame speaker, while the Constituents of Grants Town is an eternally dedicated and righteous group of citizens, at this point I must also inform this Parliament, that my Constituents are also a bemused and cynical group because of the haste in which this Parliament is again addressing a number of critical Bills brought to this Parliament. Madame speaker, the Grants Town Constituents remember well how over one year ago, the FNM Government was force-feeding a number of Bills through this Parliament and down their throats. Bills, Madame speaker, which radically altered our Financial Services Sector and the Constitutional and economic fall out from those hasty and ill-conceived acts of legislation. Madame speaker, how well the Constituents of Grants Town remembers in horror, what the effects of those pieces of legislation were and are. And Madame speaker, here we go again as we participate and the Grants Town Constituents witness this FNM Government’s display of insensitivity to the people’s concerns about its haste and the government’s blissful ineptitude at dealing with our precious Constitution. However Madame speaker, notwithstanding the frivolous manner in which the government is conducting the discourse of the Constitution and its amending, I am compelled to offer my Constituents’ views about the amendments as being proposed by the FNM Government. Madame speaker, the Constitution of the Bahamas is the most important document for humanity in our society, seeking the orderly functioning of our people and those who visit our shores. Being more than words, the Constitution is a living organism, that like all organisms should be monitored and fed with positive elements and starved of those things that time and progress causes to become irrelevant and non-productive. Madame speaker, in fact the Constitution should be reviewed on a relatively regular basis to decide on what is working for the orderly functioning of society and what needs altering and elimination. Madame speaker, it is unfortunate that the Government of the Bahamas has decided at this eleventh hour to review many aspects of the Constitution with a view to making a slew of changes. Most persons would say, inclusive of the Grants Town Constituency, that the government waited too late to make changes to the Constitution and its approach in doing so leaves a lot to be desired. Madame speaker, while I concur with the general views of most person concerning the government’s harem-scarem approach, it is the Constitution that we are debating and it is my duty to address the concerns of my Constituents in that regard. However Madame speaker, I find solace in the fact that how the people feel about the government’s approach, will ultimately bear out during the upcoming general elections. Madame speaker, the Constitution of the Bahamas was purposed and designed to encompass the roles of those in this entire society to ensure its smooth and orderly functioning. It addresses what should be the orderly functioning of the Executive Branch of Government, the Judicial Branch of Government, the Law Enforcement Branch of Government and the Civic Branches of this society. 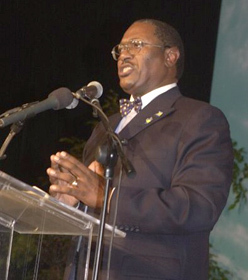 In that regard, the Parliament of the Bahamas, the Courts of the Bahamas, the Law Enforcement of the Bahamas, the Civic Leaders of the Bahamas and the Written and Electronic Media of the Bahamas, all play a vital role in this society’s functioning. Madame speaker, as these branches of our society goes; so do we. Madame speaker, these pillars of our Constitution, are not only vital to how our citizens react to the norms of society, but likewise how the international world views our social structure; allowing us to either exist as a colleague in the world’s affairs, or be considered a plague to be avoided at all material times and in some cases, at all cost. Madame speaker, it is in that regard that I view with much concern the Amendment establishing the Office of Public Prosecutions. This Office will be a most critical component because the complaints have been many since we have become an Independent Nation, about the effectiveness of the process of successful prosecutions, which dictates what kind of society we are shaping. Madame speaker, in regards to establishing the Office of Public Prosecutions, I can only view this Amendment to the Constitution as non-political. In fact, I firmly believe that this component must be viewed as nationalistic, until such time as any bias is shown toward the Office being handled in a politically skewed manner. However Madame speaker, I support the establishment of the Office of Public Prosecutions, even though the hasty manner in which the government is moving along, leaves a lot to be desired, as I stated at the outset. Madame speaker, as with all things we are reviewing concerning the Constitution, it would be my hope that the outcome finds itself putting more teeth in the Constitution, guaranteeing tangible results, where the Constitution is not merely a sacred document that proves a country has arrived safely into the civilized world. Madame speaker, the Constitution speaks clearly to matters in a society, but far too many times these utterings are not given life because Government’s do not properly enforce the utterings, for any number of reasons, one being political reasons. However Madame speaker, the uttering of the Constitution and its adherence therein is to be viewed and acted upon from a nationalistic view. Madame speaker, in that regard, I would hope that the Office of Public Prosecutions finds itself operating within the strict tenets of the Constitution, satisfying those who seek relief and redress and holding those responsible, who are in fact responsible, regardless of their affiliation to any groupings of persons in a society. In fact Madame speaker, I suggest that in this instance for anyone who doesn’t adhere to the tenets of the Constitution concerning public prosecutions, should also find in our Constitution severe penalties for not doing so. Madame speaker, I must take this view because besides for the orderly functioning of our citizens, the world at-large is always watching the status, progress or lack thereof concerning how we settle matters of grievance, whether criminal or civil. Madame speaker, it is dangerous for any country to show itself through its Court System, Executive Governance, Civic or Media Groupings to be less than forthright or suspect in its dealings. We would be a country being treated and acting as one that is not a part of the world’s norms, denying us the benefit of existing in what is considered to be a globally shrinking world that deems it necessary to coalesce with our worldly neighbors. Madame speaker, it is in this regard that I would hope the government addresses what I consider to be a serious concern that must be addressed by the nation, not from a political aspect, but a national aspect and is likewise a classical case for the Office of Public Prosecutions. Madame speaker, in keeping with our debate on this Amendment to the Constitution bringing on stream the Office of Public Prosecutions, I now lay on the table of this Parliament a document that speaks to the definite need for this Amendment. Madame speaker, I spoke of the pillars of our society that must be monitored and supervised by our Constitution. I likewise mentioned the possibility of the Office of Public Prosecutions from time to time having to intervene on behalf of individuals or persons to bring curative measures to grievances perceived or otherwise. I spoke of those pillars being the Executive, Judicial, Law Enforcement, Civic and Media Branches of our society. Madame speaker at some point, this Amendment ushering in the Public Prosecutions Office, would be needed to intervene to settle what may be perceived as a wrong done in society. Madame speaker, it is in this regard that I wish to look at one of our pillars of society and the future role that the Office of Public Prosecutions can play in the orderly functioning of such. Madame speaker, that pillar of our Constitution is the Written and Electronic Media. Madame speaker, I am certain that Members of this place should be aware of the emergence of a weekly periodical named the Confidential Source. Madame speaker, here is one such copy of the newspaper, which I intend to lay on the table to be considered in juxtaposition to the documents I just laid on the table. Madame speaker, I would be surprised if all Members of this place have not seen or have not been following the newspaper. I would expect that many would be following this newspaper maybe for its information or maybe for its newness on the Bahamian scene. Madame speaker, without having any personal interest in the newspaper, I must express that the Confidential Source is free of charge and is printed on high quality paper. Madame speaker, I now lay on the table a copy of the January 2, 2002 edition of the Confidential Source, Volume #9. It is to this particular edition and its disturbing headline, that I will show the need for the Amendment to the Constitution regarding the Office of Public Prosecutions. 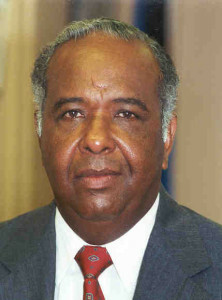 Madame speaker, the January 2, 2002 edition of the Confidential Source has at its headline, “Hubert Ingraham accused of influencing Supreme Court and Attorney General.” Madame speaker, I realize that certain matters concerning some persons involved is the subject of a slew of court proceedings and I wish to state from the outset, that my serious concern does not attach itself to the court proceedings and I in no way wish to even assess or lend any assessment to those cases. Madame speaker, it is to the charges of our otherwise sterile Judiciary being influenced by anyone that I wish to now read into the record the contents of the headline story. Madame speaker, accompanying this story are the supposed notes of Justice Anita Allen, that is not germane to the point I am attempting to have resolved. Now Madame speaker, there is a time when situations, circumstances and crises presupposes a national concern or dilemma and should not be viewed from the prism of politics, unless silence on the issue leads one to the conclusion that a political aspect took precedence over the national concern. Madame speaker, short of someone committing treason, the accusation of someone being accused of using their influence to dictate to the Judiciary has a most disastrous consequence for a nation within its confines and outside of its borders. Likewise Madame speaker, when a former Cabinet Minister, a duly elected Member of Parliament and Officer of our Courts by profession gives information holding up the Judiciary and the Prime Minister to criminal suspicion, one such person must be condemned for the untold pain and misery that can result from such a reported belief. Madame speaker, this is a matter that must be cleared up and I’ll tell you why. When a country’s Judiciary is held up to be anything but pristine, the Body Politic, Government Agencies, Financial Institutions and groupings of Tourists throughout the civilized world, views one such country as one that should be avoided. Madame speaker, how are we to exist, function, progress and prosper, if the world at large is to believe that justice cannot be found on the Judicial level of our country? If our Judiciary is under some other influence than our Constitution, or if someone is merely playing a devious game; I must ask what kind of sick mind, would attempt by their undertakings to bring untold misery on the Bahamas? The kind of misery that could take decades, if not longer, to convince the world otherwise about our Judiciary. Madame speaker, I make no apologies for my political approach to most matters that comes before this House, for that is part of my job as a Representative of people. However, I also make no apologies for my position as a Bahamian who takes very seriously our nationalism and good standing on the world scene, being under attack from within or from without. And it is from that perspective of nationalism that I ask the following questions in the hopes that my yielding for a response, will bring honest answers and resolution quickly to this affair, so that justice on this matter is not only done, but also seen to be done for our citizens and for the world. A world that has to be monitoring our reaction to this damaging account in the Confidential Source. • 1. DOES THE GOVERNMENT APPROVE OF A FORMER MINISTER OF THE PRESENT CABINET ALLEGEDLY CONSPIRING WITH A PERMANENT RESIDENT, KNOWING THAT THE PERMANENT RESIDENT WAS IN COURT PROCEEDINGS AGAINST THE GOVERNMENT, HE NOT TOO LONG AGO WAS A PART OF? • 2. WHERE AND HOW DID THE NEWSPAPER GET THE PERSONAL NOTES OF JUSTICE ANITA ALLEN? HAS THE ATTORNEY-GENERAL STARTED AN INVESTIGATION INTO THIS MATTER? • 3. HOW COULD A FORMER MINISTER, AS THE STORY CLAIMS, AGREE TO THE PUBLISHING OF THIS NEWSPAPER ARTICLE IDENTIFYING HIM AS THE SOURCE OF INFORMATION, PUTTING IN JEOPARDY THE JUDICIARY AND THE COUNTRY? WAS OR IS THERE ANY MONETARY CONSIDERATION ATTACHED TO THE MEMBER FOR MARATHON’S WILLINGNESS TO BE EXPOSED AS THE INFORMANT? • 4. MANY ASK WHAT WAS THE MOTIVATION OF THE SAID NEWSPAPER TO PLACE IN JEOPARDY THE BAHAMAS JUDICIARY BY THE CLAIM THAT IT CAN BE INFLUENCED? • 5. WHY HAS THERE BEEN NO RESPONSE FROM THE PRIME MINISTER REGARDING THE ACCUSATIONS LEVIED AT HIM AS THE ALLEGED PERPETRATOR OF INFLUENCE PEDDLING, AS STATED BY THE MEMBER OF MARATHON IN THE SAID ARTICLE? Madame speaker, I will gladly yield at this time to allow some one in the government, if not the Prime Minister and the Member for Marathon to address these questions, as this matter is one that should not go unresolved beyond this point, otherwise, one would have to think that politics did in fact take precedence over the national aspect of such a damning account being public for our citizens as well as the outside world to see. Madame speaker, it is unfortunate that all of the Government Members are not prepared to speak on this issue, knowing that such a story has been out in the public for two weeks. And Government Members still do not seemed prepared to talk about this matter. Madame speaker, this display of callousness on behalf of the government, or possibly fright, as it is a scary situation, leaves me to conclude that in fact the politics of internal warfare has had a bearing on our being at this point. The point where our Judiciary comes under fire, as being in the rawest terms, corruptible. The government’s unwillingness to settle forthwith this matter concerning the report in the said newspaper as well as the document I laid on the Table, leaves me to conclude that a whole country was placed in jeopardy because of the political aspirations or failures of individuals. Madame speaker, I now wish to read excerpts from the document I laid on the table that is in fact an Affidavit signed by one of the persons affiliated in some form with the newspaper, the Confidential Source. Madame speaker, Members will find that this affidavit gives all the reasons in the world why the Amendment to the Constitution for the Office of Public Prosecutions is a needed piece of legislation returning some credibility to our Judiciary. Something that may be seriously diminished by the dastardly report in the said newspaper. Madame speaker, in the absence of any stated monetary advantage in the Affidavit. And taking into consideration the firing of the Member for Marathon from the Cabinet. And his subsequent hiring as a Consultant to an aggrieved person included in the story; one can readily conclude that the dissemination of the said story and the quotes of the Member for Marathon came as a result of his scorn at being rejected as Party Leader of the FNM. Madame speaker, how else can one look at this dastardly and damaging act perpetrated on this nation? Madame speaker, I have asked myself a million times, how could a Bahamian put the country in jeopardy because his desires were not allowed to bear fruit? How could a Bahamian who claimed his love for the Little Darlings and Precious Pearls, as well as the Disabled in this country, allow his desires to destabilize and debilitate this nation, by holding the Judiciary up to suspicion and a Prime Minister up to further public odium? And Madame speaker, I won’t even bother to consider what he’s done to his wife, her otherwise good name and his family. I’ll leave that up to God to deal with that. Certainly Madame speaker, as an Opposition Member, soon to be a Government Member, I take all sensible advantages to holding the government up to public scrutiny and criticism where it is shown to be necessary for good and honest governance. But I would never conceive of an advantage to ridicule the government, at the expense of the country being looked on as a purveyor of injustice, just for political or any advantage? What kind of tortured soul would even think of such a thing? Likewise Madame speaker, the Prime Minister, as the one accused, is also not without blame, because it is he through his scheming and connivance over the leadership of his Party that has spawned fodder for damaged ego’s and sick minds to work out their disappointments on the nation. And then Madame speaker, there is also the scary possibility that what the Member for Marathon is recorded as saying about the Member for North Abaco may have a ring of truth to it. Madame speaker, this is why I would hope this matter is resolved for the benefit of the nation and the view of the outside world concerning this nation. For God knows that we don’t need at this time or at any time, the notion to be in anyone’s mind that our Judiciary can be influenced, where it is otherwise not proven to be the truth. The thought that our Judiciary can be influenced has far more effect on the Judiciary, and the present Government in power. It can be a garment tied around this country that could eventually strangle us to death. And in that regard, Madame speaker, I call for an immediate investigation into the accusations as levied by the newspaper, the Confidential Source. Obviously because of the accusations, it would not be prudent for the Attorney-General’s Office to pursue such an investigation. This is a matter for the Police as well as a body such as the Office of Public Prosecutions, which we are seeking to establish through the amendment before us today. Madame speaker, in keeping with my concern about the Fourth Estate, also known as the written and electronic media, it also is an important tenet to our Constitution. It allows for freedom of expression and it plays a most vital role in disseminating information and educating the Bahamian Electorate about such things as the Constitution that we are discussing today. However the media can also be used as an instrument of destruction when it fails to operate within the Constitution, decency or just fair play. Madame speaker, one such instrument being used for destruction of truth and fair play is the government-owned radio and television station, ZNS. Madame speaker, I hasten to add that there is no conspiracy amongst the corporate staff at ZNS, but it is apparent that directives from political operatives is carrying the day and influencing how news should be disseminated and in many cases not disseminated at all. Madame speaker, the fair coverage of ZNS is weak and many times disseminated through a filter of guile, if reported at all. Madame speaker, it is obvious that the staff is not being allowed to do their job of reporting the news without the hindrance of political interference. And Madame speaker, for those persons who can hold the confidence of some of the staff at ZNS, they will tell of the frustration and demoralizing nature of working at ZNS where they only want to be the best that they can be at their profession. They find their professional growth suffering retardation because of being subjected to the will of those giving them political directions on how to report the news. Madame speaker, the Fourth Estate under the Constitution is guaranteed certain rights and there are obligations which goes with those rights. Madame speaker, the tenets of the Constitution has become so foreign to the workings at ZNS, that news about themselves or their political favorites are not being reported at all or in the most bizarre and beguiling manner. Madame speaker, take for instance, a few weeks ago when I reported to this House that ZNS’ Media Van, costing $1.3 million dollars was purchased without a warranty and is now in need of serious servicing. Madame speaker, it was not even reported by ZNS. One would have thought that conscience of duty would have dictated to them that it was best to report that news so as not to be considered skewed and beguiling. But no Madame speaker, not one word. And then Madame speaker, just on Monday past, the Public Accounts Committee Report was read in full to this Parliament. 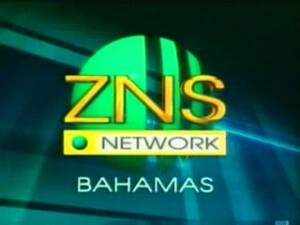 And what was ZNS’ first report on the outcome of the Committee on the One o’clock News? ZNS stated that DPM Watson was cleared of one charge. Madame speaker, what about the rest of the findings? Madame speaker, you mean to tell me that if a person is cleared of one out of six charges, the news is to be represented as it being a major finding that a person was cleared of one charge, when the most serious charges finds that person convicted? What about the fact that the DPM’s company, Nassau Transfers, was considered by the Holiday Inn as having stolen their rebate money in order to pay off part of their bounced cheques? Not one word Madame speaker, in the initial report on ZNS about funds having been stolen. Why dress up the news when the totality of the charges is a simple case of tiefin? Suppose persons listened to that first ZNS report and decided that they had heard all that was needed to know? And if you saw this morning’s scandalous, disgraceful and misleading headline in the Tribune, entitled, “Watson cleared by PAC,” you would believe that the DPM’s company was the victim and somebody else tief the Holiday Inn’s rebate money. Madame speaker, it is obscene and repugnant how some of the media seeks to protect the worst of criminals; at the expense of telling the people the truth. Like criminals, they too seek to protect their own interest. In fact Madame speaker, even the report that I have brought to this Parliament concerning the tragic affair of the Confidential Source Newspaper’s claims were not reported by ZNS, or in fact any other media outlet. If it were up to the other media to announce that a new publication such as the Confidential Source was in the public, we would never know that it exist. Madame speaker, the question is why? Under the Constitution the media has as its obligation to report news to the public in order to inform and educate. Sadly Madame speaker, this is not happening and political interference is still lurking around after all these years and all the promises of the FNM Government to the contrary. Madame speaker I was most disheartened but not surprised that the government is seeking to debate all of these Constitutional Amendments as if there are a quota of Bills that must be passed every time this Parliament sits. 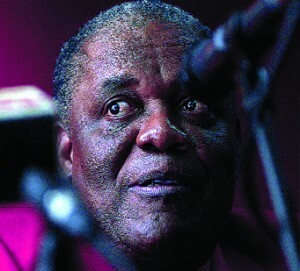 Madame speaker, despite the declaration by the two major Political Party’s in their respective 1997 Party Platform’s to amend the Constitution, the Governing Party has for reasons best known to them have waited until the waning period of the impending elections to introduce a number of amendments to the Constitution. Madame speaker, it is clear to me that this government has no plans of substance. They can best be described as a flip-flop government. Madame speaker, any serious political observer of this government must be experiencing a serious case of head spinning at its attempt to follow the actions of this flip-flop Government. Madame speaker, I wish to remind this place of what was said during the 1997 Speech from the Throne. Madame speaker, that is what the lame duck Prime Minister had to say about his plans for Constitutional Reform. But what are we actually doing? We have for the last four weeks been debating and passing Amendments to the Constitution in a most obscene and reckless manner. Madame speaker, thinking Bahamians are asking why did the government abandon its well-programmed approach to Constitutional Amendments without a logical or sane explanation to the Bahamian people? Many persons have concluded that this government of one has lost its senses and his puppets never had any sense. And here we are today putting the cart again before the run away horse because the appointment of a Constitution Commission was never completed. 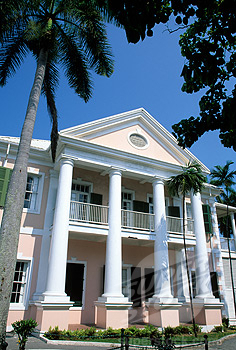 The public was never encouraged to read the Bahamas Constitution. No Town Meetings were held. 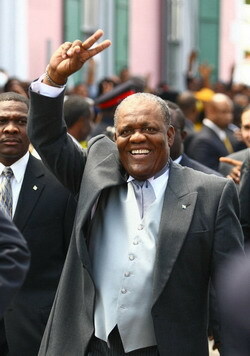 And simply put, the government abandoned its stated commitment to educate the Bahamian people on Constitutional Reform. Madame speaker, the lame duck Prime Minister fell asleep at the wheel, or something else that would question his sobriety. 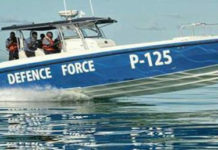 Madame speaker, the Member for North Abaco found himself and his puppets attacked on all corruption fronts and out of the clear blue sky he found what he considers to be a necessary diversion. Hence Madame speaker, we are here debating the issue of Constitutional Reform. Well Madame speaker, I have news for the lame duck Prime Minister, his attempt at diverting from the charges of corruption is not gonna work. 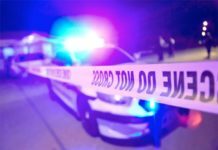 The charges are not going to go away until the guilty is sent away from public life and if necessary, sent to a place where average citizens go every day when they are convicted of a crime against society. In fact Madame speaker, before I sit down today, I will give the Member for North Abaco something else to investigate and hopefully he’ll have the answers by the time he comes to debate the Public Accounts Committee Report, as he vehemently stated was his desire to so do. Madame speaker, it should now be crystal clear even to the confused mind of the lame duck Prime Minister that the last minute constitutional reforms has not resonated well with the Bahamian people. In fact, many Bahamians feel insulted by the maximum leader’s attempts to push Constitutional Reform down their throats which such indecent haste. But you see Madame speaker, the maximum leader has to find something to occupy the time in Parliament because he has no idea what other allegations of corruption is coming his way, once the Opposition is in attendance in the Parliament. Like a wet rat with no place else to hide, all kinds of ploys are being used to avoid detection. Madame speaker, the advent of these amendments to the Constitution is one such ploy. But the people are not fooled. • 1. 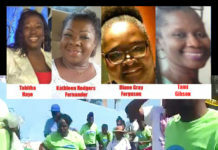 THEY WERE ORDINARY BAHAMIANS THAT COMPRISES THE VAST MAJORITY OF THE BAHAMIAN ELECTORATE. • 2. THEY HAD NEVER READ THE CONSTITUTION OF THE BAHAMAS AND CANNOT RECALL THEIR RELATIVES AND FRIENDS HAVING DONE SO. • 3. THEY DO NOT UNDERSTAND THE PROPOSED AMENDMENTS TO THE CONSTITUTION. • 4. 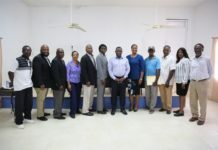 THEY HAVE SERIOUS RESERVATIONS AS TO WHETHER THE BAHAMIAN ELECTORATE THROUGHOUT THE BAHAMAS COULD BE EDUCATED WITHIN THE TIME FRAME PROPOSED BY THE GOVERNMENT. Madame speaker, under these circumstances, how can this government justify doing what it is doing? Madame speaker, it cannot justify what they are doing as being in the best interest of the people. But then they are not trying to justify their actions, they are trying to hide from all of their corruption charges and inept governance as they fall apart in the midnight hour of their last days in Office. Madame speaker, it is the wet rat trying to find one more hole to hide in, or creating some other diversion to take our eyes off of it being what it is, a wet rat. Madame speaker, in the interest of time, I conclude where I began by laying on the table of this House four documents where we have another case that must be investigated from a national perspective and one that is a clear case for the Office of Public Prosecutions. I would hope Madame speaker, that as I conclude the nation would agree to why amendments to the Constitution must have real substance to effect change as well as penalties for government’s and its agencies that don’t follow the rule of law to the strictest terms and definitions. Madame speaker, the details of what could be yet another heinous act I will again leave for the accused to debate, for I do not want this to be a political exercise. Matters where the nation’s credibility or a government’s legitimate mandate to serve is under attack cannot be viewed from a political perspective. Madame speaker, I have been concerned for some time now about a set of documents that have been widely disseminated in this society, of which I have just laid on the table, concerning the stated activities of the Member for North Abaco when he was a PLP Cabinet Minister. 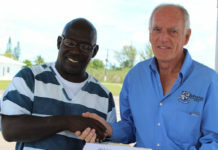 Madame speaker, the documents on the table when followed in sequence of the dates, states that the Member for North Abaco was involved in sensitive and clandestine talks with American Government Officials. And Madame speaker, when we understand the contents of the documents we will recognize that it states he was engaged in these discussions when he was a Cabinet Minister. Madame speaker, I have to believe that this is a matter that cannot be allowed to stand unresolved in the public, just as the matters concerning the Member for Marathon as well as the Minister’s of Education and Tourism. Madame speaker, the communications in the documents have been disseminated to the public for six years and at various times by a local tabloid newspaper and have been the subject of many political discussions. And the Member for Shirlea, I believe, alluded to these allegations prior to the Christmas Recess and I raised the matter in this place as a question to be answered by the then Attorney-General, the Member for Yamacraw. Madame speaker, as with many questions on the agenda, this question was never answered. Madame speaker, the question I asked was who is CI-1622, which in law enforcement vernacular means, who is the person listed as Confidential Informant #1622? Madame speaker, the documents before this House states in sad detail that the Member for North Abaco was at some point a Confidential Informant for a foreign government. Madame speaker, as with the Member for Marathon, I likewise look not to politicize nor dramatize what is a serious national issue. Madame speaker, the first letter in chronological order is dated September 21, 1983. Madame speaker, at the top of the letter are markings that apparently seeks to avoid recognition of what may be sensitive information. Madame speaker, the letter is addressed to one Andrew, who I have come to find out was former Charge d’Affairs at the US Embassy, Andrew Antippas. 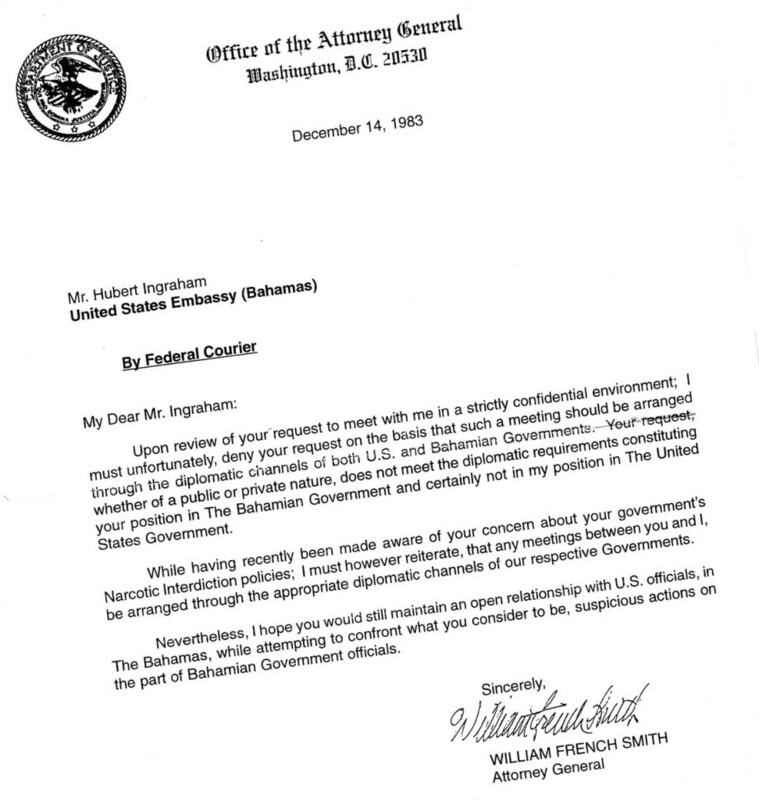 The letter reads as follows: (Read Sept. 21, 1983 Letter). Madame speaker, we can easily look for answers from the one who signed the letter, the Member for North Abaco, because he is alive and well. I also believe that Andrew Antippas can also be located because I believe that he is still the High Consulate to Vietnam, having also served for the United States as the High Consulate to British Columbia, Canada. Madame speaker, the second letter in chronological order, is dated December 14, 1983. 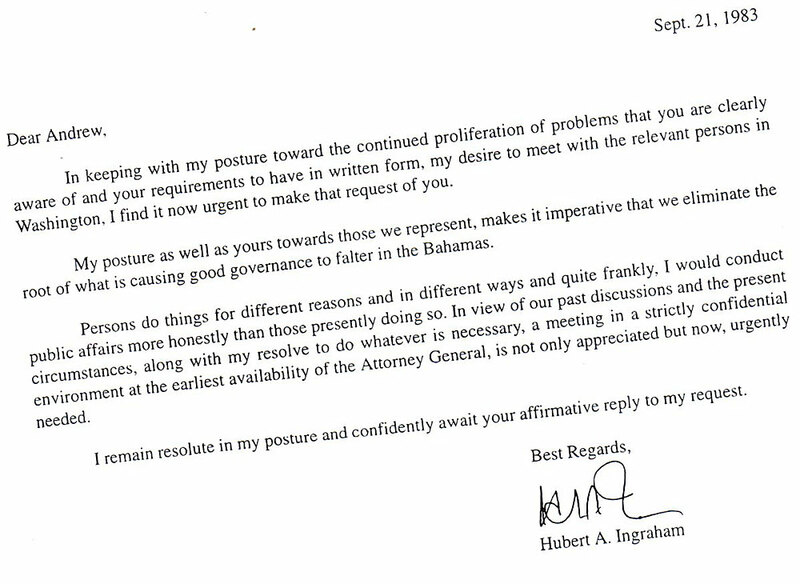 Madame speaker, one could assume that this letter according to its contents was in response to the Member for North Abaco’s letter of September 21, 1983. Madame speaker, this letter is addressed to the Member for North Abaco and sent by Federal Courier to the U.S. Embassy and read as follows: (Read Dec. 14, 1983 Letter). Madame speaker, this correspondence though lengthy speaks again to the importance of Confidential Informant #1622 and the need for cooperation between two obviously bickering U.S. Attorneys. Madame speaker, the signee of the letter Mr. Edwin Meese I believe can easily be found in California, as I believe he is the Chairman of the Richard Nixon Library/Foundation. 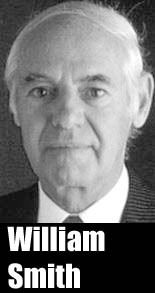 I cannot say where Mr. Leon Kellner can be found because he retired from government service in 1988 or thereabouts. However Madame speaker, the person stated as CI-1622 is in our jurisdiction and can be called on to answer in this House, as the information is stating that it is the Member for North Abaco. Madame speaker, this serious matter, if left unresolved could one day and once again damage the credibility of Governance in the Bahamas, just as the days of drug trafficking damaged the first Independent Government in the Bahamas. Madame speaker, it could one day come back to haunt us if left unresolved because we know that what is done in the dark will one day come to the light. In that regard Madame speaker, I would like to give the Member for North Abaco the opportunity to consider carefully what is the right thing to do. And when he comes next week to debate the Public Accounts Committee Report, he also allows us to let it all hang out and likewise debate this matter. 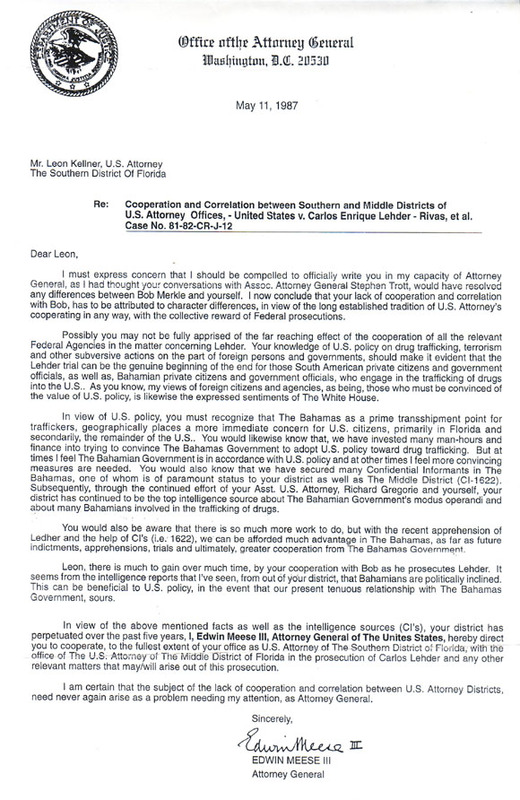 I also request that an investigation be established forthwith by the Attorney-General of the Bahamas into these serious charges, as documented, with a view toward prosecution for Treason, if these charges are proven to be correct. I would also hope that these investigations don’t go the way of the investigations promised on the Minister’s of Education and Tourism. For we have yet to hear anything about the findings. Again Madame speaker, as this and the matter of the Member for Marathon are not political, but national, I pray that for the peace, stability and continued harmony of this country these charges once thoroughly investigated prove to not be what many persons have suspected for some time. For no one should want to have lived in a time when a traitor was in our midst and managed to attain the highest Office in the land. It will cause us to speculate as to why some things in the FNM’s time of governance was done they way it was done. Madame speaker, I await the outcome of this investigation by the Attorney-General. May God be with those who are under such serious accusations, the likes of which have hardly ever been seen in any country since the beginning of time. AND ON THAT SAD NOTE, ON BEHALF OF THE GRANTS TOWN CONSTITUENCY, MADAME SPEAKER, I THANK YOU. Next articleBTC actually sold for less than $195 million to C&W.